Chakras are energy centers in our body that need to be balanced through diet, meditation and healthy living. Working with crystals can help us keep our energy in alignment. 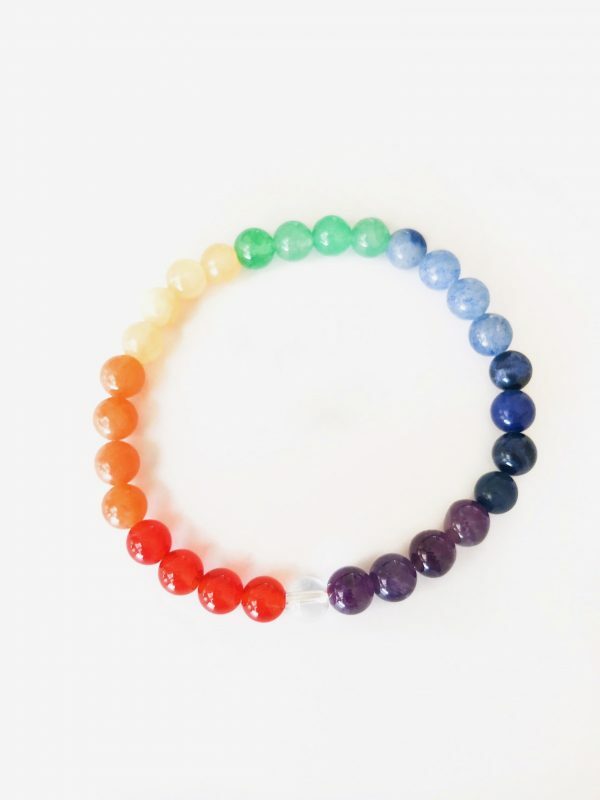 Wear your chakra bracelet to help keep your chakras in alignment and ready to work with you. RED AVENTURINE: Increases energy. Helps you to act on your dreams. Awakens your passion for life. Increases creativity and confidence. Activates and energizes the root chakra which is where we store money issues and family of origin wounds. Red Aventurine helps you learn to believe in yourself so you can create the abundant life you deserve. CARNELIAN: Carnelian is called the The Stone of Creativity, Courage and Clearing. It’s a powerful, hard-working stone that protects your energy from taking on other people’s stress. Carnelian helps cleanse and activate the second chakra – increasing your creativity and passion for life. One of Carnelian’s main job is to charge the other stones around it. This is why I call it the cheerleader of other stones. YELLOW JADE: Increases wealth, good fortune and friendships. A cheerful stone, Yellow Jade brings joy to your energy. 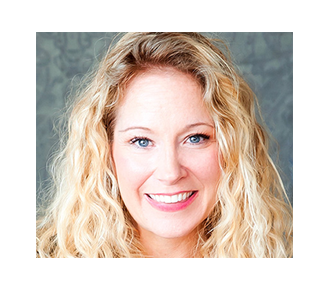 It activates the solar plexus chakra which is where we store our feelings of self-confidence and inner happiness. GREEN AVENTURINE: A stone of luck in love and money, Green Aventurine helps you attract prosperity and love in amazing ways. 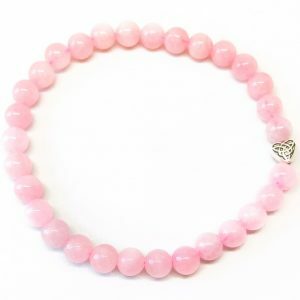 It activates your heart chakra to keep your energy open to receiving unconditional love. BLUE QUARTZ: A calming stone, Blue Quartz brings a feeling of inner balance and serenity to the wearer. It increases dream work and strengthens clairvoyance. 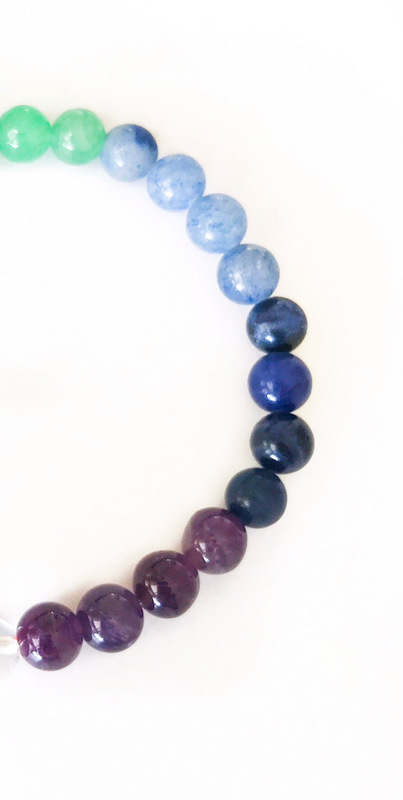 Blue Quartz activates the throat chakra helping you to communicate more clearly and speak your truth. SODALITE: Sodalite is called the Stone of Endurance and is recommended for writers and athletes as it helps to accomplish long term goals. It helps you to stand up for yourself. Sodalite encourages intuition – especially Clairaudience and Clairvoyance. Sodalite helps awaken the Third Eye. It’s recommended for students, athletes, writers and teachers. AMETHYST: Amethyst is called The All Healer. It helps you accept yourself just as you are. It’s a stone for balance, protection and spiritual love. Wearing Amethyst helps us awaken to our true spiritual path. It activates the crown chakra so that we can feel a deeper connection to spirit and get in touch with our true gifts and purpose. CLEAR QUARTZ: For the higher 8th chakra, I added one Clear Quartz bead. The 8th chakra awakens us to our true spirit. Clear Quartz is an energy amplifier. 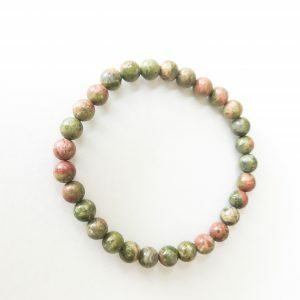 It will enhance the energy of you and the other stones on the bracelet. Clear Quartz helps you to see yourself and others clearly. It increases clairvoyance. 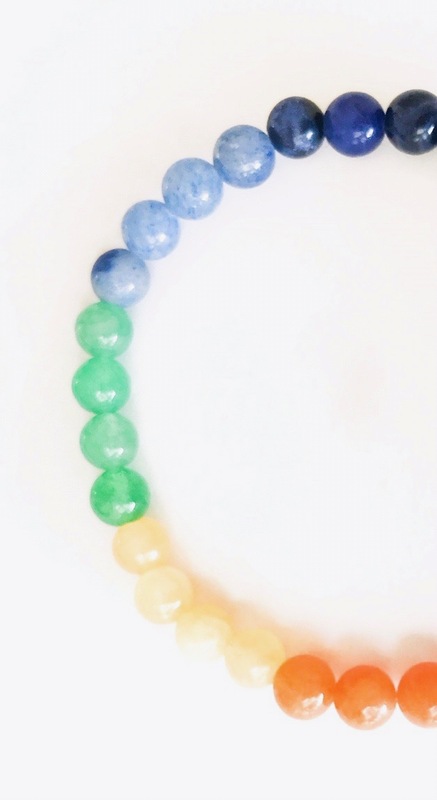 Your Chakra Bracelet is made with 6 mm stones and is 7 ” in length. If you need a bigger or smaller bracelet, please let me know. Thank you!